Coming off winning the NCAA Division II Indoor Championships Weight Throw two weeks ago, Findlay University Jr. Tynelle Gumbs, opened her outdoor season with a Hammer Throw National Record effort to kick off her 2017 outdoor campaign at the Raleigh Relays in Raleigh, North Carolina on Saturday. Gumbs unleashed a third round effort in the Hammer that reached 56.63m (185’9”) to place seventh overall among collegians. The measurement eclipsed her year old 56.13m (184’1¾”) that she threw in El Paso, Tex., when she was at Central Arizona College. Gumbs had her best season opening mark as a collegian in the Discus Throw on Friday, when she twirled the implement 45.72m (150’0”) and finished 10th among collegians. Twin sister Trevia was 17th overall with a heave of 43.20m (141’9”). 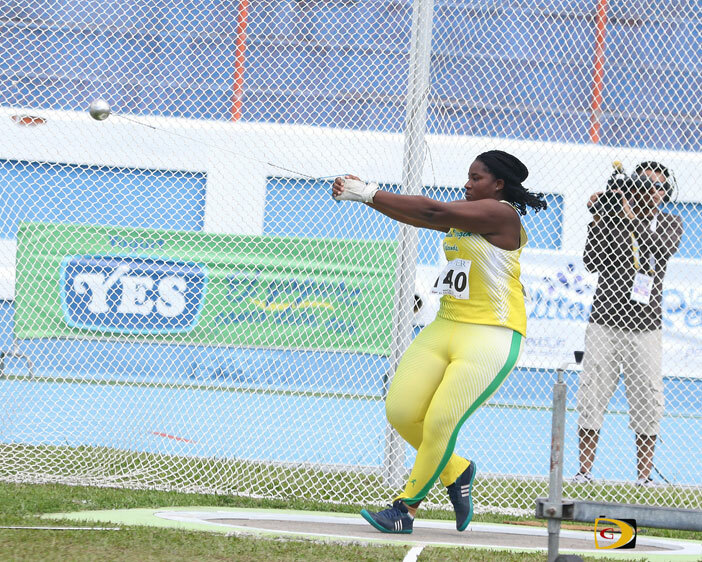 In the Shot Put, Trevia finished with a subpar effort of 11.84m (38’10¼”), well off her best indoor mark of 13.78m (45’2½”) this season). Elsewhere, Clemson freshman Lakeisha “Mimi” Warner, made her 400m Hurdles debut with a sixth place finish in 1 minute00.39 seconds at the Miami Hurricanes Invitational. It was her irst race over the barriers since last July when she competed in the IAAF World Jr. Championships in Poland, where she clipped the first hurdle and fell in that race. Tarique Moses, a Central Arizona freshman, was fifth in the 800m at the Puma Outdoor Invitational, held at Paradise Valley Community College in Arizona. Moses ran a personal best of 1 minute, 59.13 seconds. Coming off her National Jr. Colleges Athletics Association Indoor Championships 60m victory, Iowa Central freshman Nelda Huggins, began her first collegiate outdoor race with a fourth place finish in the 100m at the Arkansas Spring Invitational in Fayetteville, AR. She recorded a time of 11.96 seconds, ran into a -0.6 wind. Teammate Judine Lacey was fifth in her 400m heat in 59.02 seconds. South Plains sophomore Taylor Hill, won her 100m heat at the University of Texas El Paso Spring Invitational and finished eight overall in 12.04 seconds. She was sixth in her 200m heat in 26.24 seconds. At the South Carolina’s Weems Basking Invitational Shaian Vandenburg of Monroe College, had wind assisted times of 12.46 seconds and 25.19 in the 100 and 200m.